The words ‘tough’ and ‘Polo’ have been mutually exclusive since Volkswagen pulled the pin on its WRC program last year. 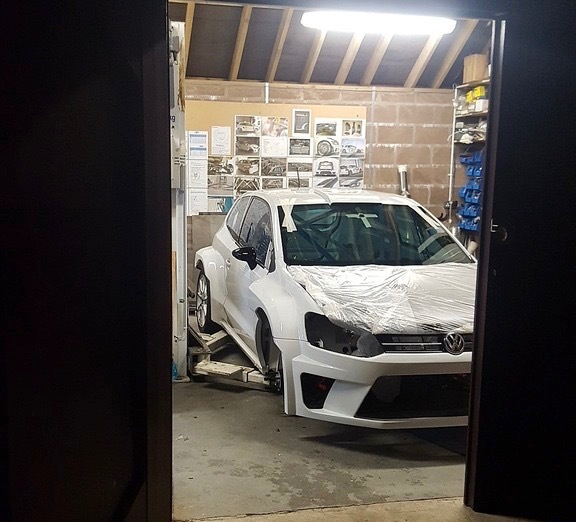 That’s until you realise some madman has stuffed the drivetrain from an R32 Golf into a two-door Polo in his shed – 4motion drivetrain and all. 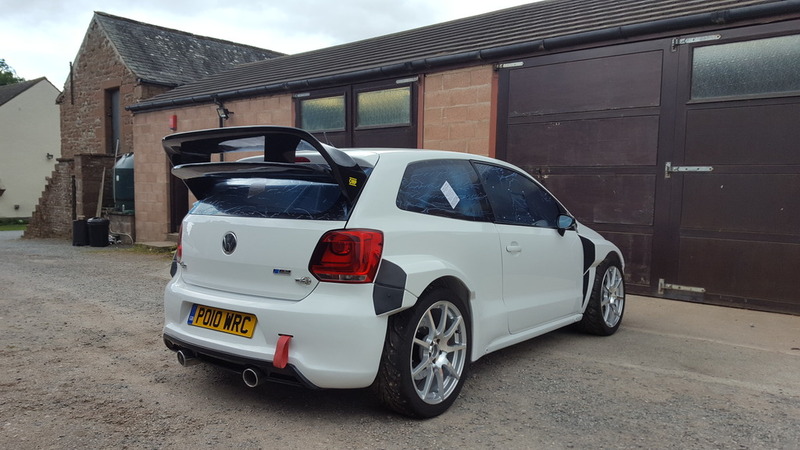 The fun hasn’t stopped there though, as there’s now a turbocharger attached to the 3.2 litre VR6 and a full WRC bodykit fitted as well. This is a slightly simplistic summary of the insanity that has taken place. 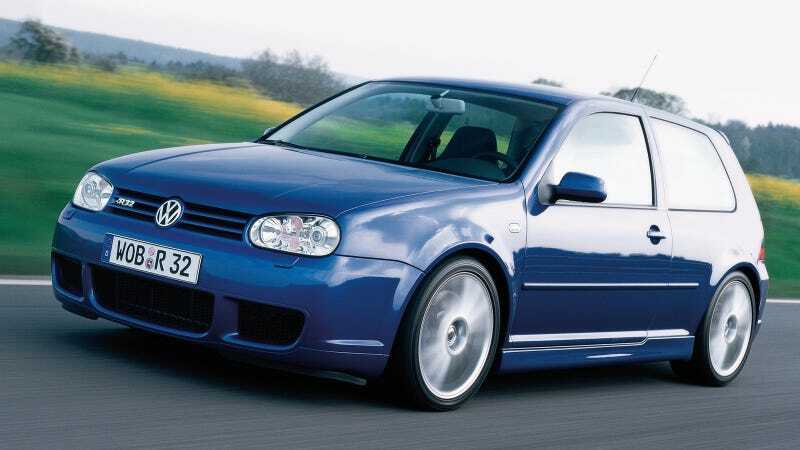 As you can imagine, replacing a 1.4 litre four-cylinder with a whole-lotta turbocharged, four-wheel-driven, VR6 goodness wasn’t exactly a cakewalk. 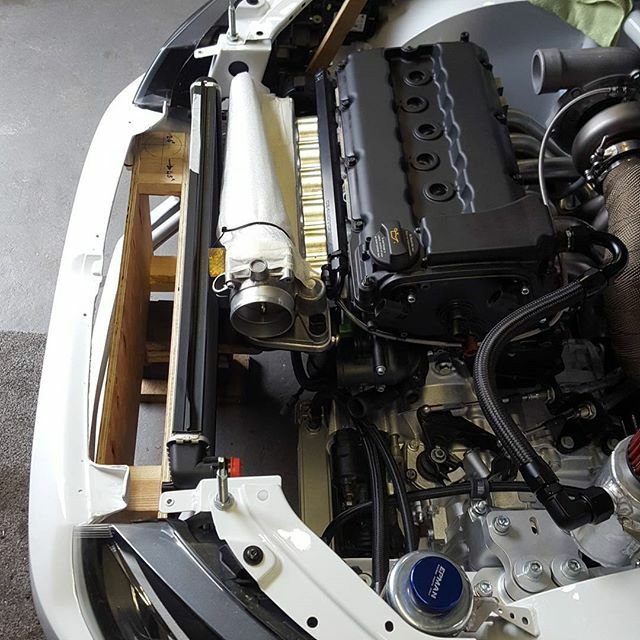 This Polo takes the small car, big engine to a whole new level. To start the project, a Polo 6R 3 door was picked-up with front end CAT D damage. The minor front end damage wasn’t an issue as the radiator support, bonnet and front bar would be relegated to the bin anyway. The Polo keeps the OEM front subframe mounting points with a R32 subframe modified to fit. This will allow its creator to ditch the VR6 for something lighter if this set-up turns the Polo into a led tipped arrow. Fitting the considerable girth of the VR6 into the Polo’s diminutive chassis rails was only possible thanks to the use of new engine solid mounts, custom alternator bracket, engine pulleys and the removal of the A/C. 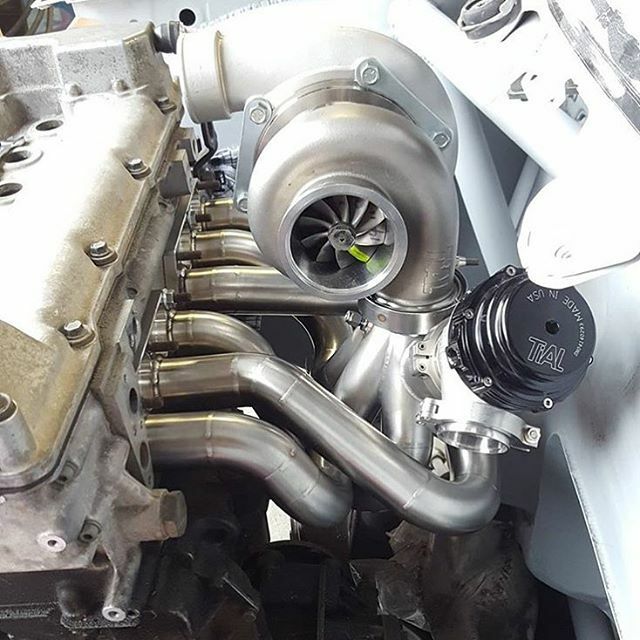 The VR6’s head (one head despite it being a V6 due to ultra narrow V) underwent significant porting to flow the gasses into and out of the GTX3582 turbo. The hot side of the turbo exits into a 3.5″ down-pipe while the cool side is fed by an air filter below the head light. Big engine. Big turbo. Small car. The GTX3582 turbo in all its glory. The Polo’s standard transmission tunnel would’ve technically worked with the 4motion drivetrain, but plans to run the turbo’s down pipe and exhaust in there as well meant a new sheetmetal tunnel was fabricated. Another plus of the new ‘tunnel was the chance to move the seat rails rearward for weight distribution, just like in the ‘real’ WRC cars. The roll-cage, again shed built, ties together the custom billet alloy suspension tops (front and rear) and even the custom subframe mounts (again, front and rear). It also sits just 10mm from the roof to keep some practicality in the Polo’s cabin. The front suspension set-up is based on R32 Golf geometry (8° castor compared to the Polo’s 4°, if you’re interested) with tubular lower control arms and rose-jointed mounts. All four wheel wells have been severely chopped to allow for the suspension, wheels and massive WRC spec’ guards. 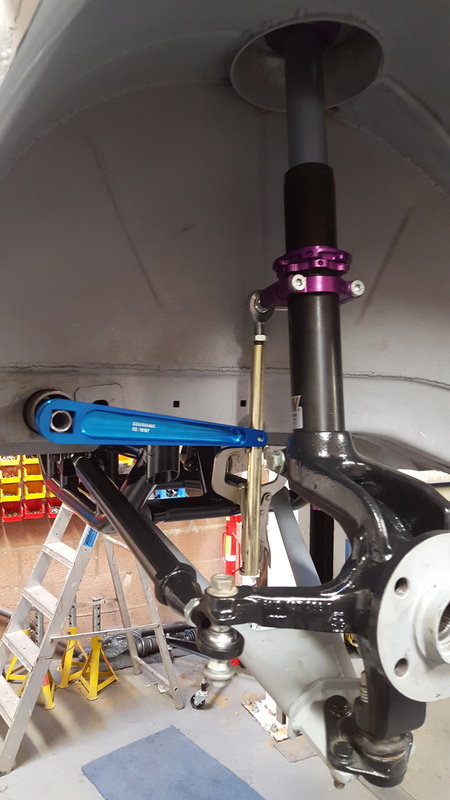 KW Competition 2 suspension is bolted in those previously mentioned custom suspension tops and sticking with the WRC theme, M-Sport supplied Fiesta WRC rear anti roll bar arms that connect to another home made piece, the anti roll bar itself. M-Sport supplied rear anti-roll bar arms meant for WRC Fiestas. Also visible is the custom rear sub-frame and KW suspension. The rear diff has also been poached from an R32 and sits in a tubular sub-frame which is bolted to chassis rails that have been notched – keeping the driveshafts level at the Polo’s new ride height. This is a good indication of the engineering prowess and thought that is going in to this build. Literally no stone has gone un-turned during this build, and while the little Polo hasn’t yet turned a wheel in anger, when it does it’s sure to be…interesting. If you want to stay up to date on this seriously tough Polo, head over to the full build-thread, here. Not exactly a shrinking violet with the WRC spec’ body, but this Polo definitely has the bite to match the bark.